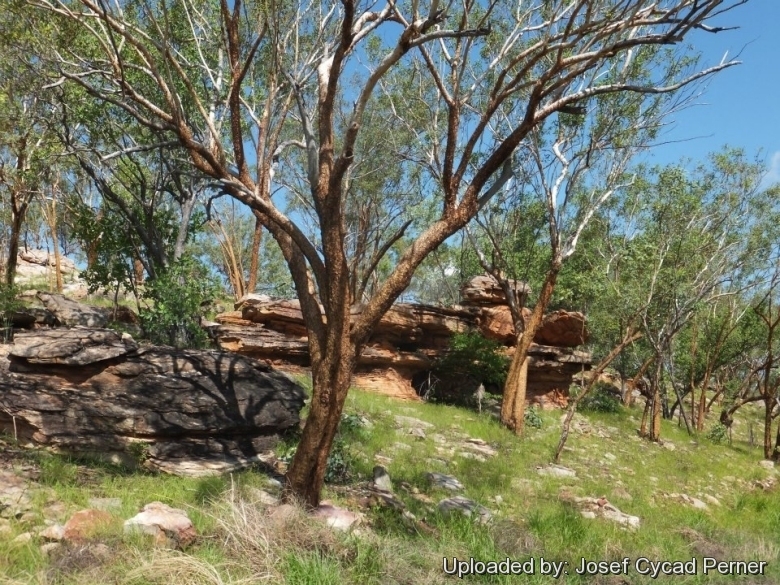 Origin and Habitat: This distinctive tropical Eucalypt is found in the northern regions of Western Australia (mainly fond within 160 km of Wyndham) and the Northern Territory (especially in the Darwin-Pine Creek-Victoria River region, and the scarps of Arnhem Land) at a latitude of 16°S. There is also a small Queensland population, restricted to a site near Cooktown. Altitudinal range: From near sea level to 300 metres. Habita and ecology: Eucalyptus phoenicea grows in steep rocky slopes to gently sloping, stony terrain. The soils are poor and include both skeletal and sandy types, with granites, basaltic volcanic rock and sandstones as the common parent rocks. Eucalyptus phoenicea grows in open woodlands, savanna of Triodia microstachya grass or forests, sometimes locally as the dominant species but usually in association with other eucalypts. 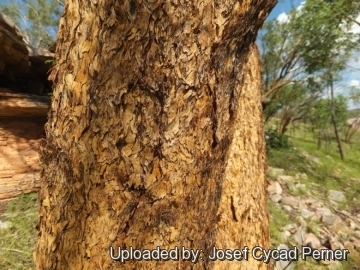 These include Darwin woollybutt (Eucalyptus miniata), Darwin stringybark (Eucalyptus tetrodonta), variable-barked bloodwood (Eucalyptus dichromophloia), ghost gum (Eucalyptus aparrerinja) and tropical red gums from the Eucalyptus alba group. The accompainig vegetation also comprises Cheilanthes tenuifolia and Culcita dubia. Hottest months 33-39° C, coldest months 13-19°C and mostly frost free. Rainfall 700-1500 mm per year, mainly in summer. The seeds of E. phoenicea are eaten by the Yellow-tinged Honeyeater (Lichenostornus flavescens). 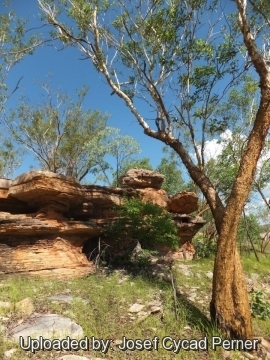 The tree has been collected illegally from some Aboriginal lands and concerns have been expressed regarding the sustainability of this type of pilfering. 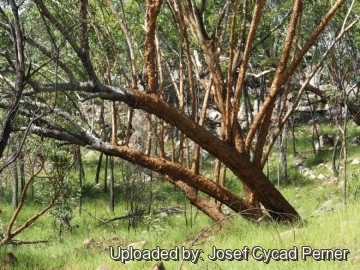 Description: The Scarlet Gum or Gnaingar (Eucalyptus phoenicea), is a beautiful small to medium-sized tree or mallee (a clumping form of eucalypt with multiple stems springing from an underground lignotuber), with long and narrow foliage of the myrtaceae family that was first described by Ferdinand von Mueller in 1859. Usually it is 6-12 m in height and up to 30 cm in diameter, but the trees of the disjunct Queensland occurrence are typically taller, have better form and reach 25 m tall with trunks exceeding half the tree height. It is placed in the informal subgenus Eudesmia and in its area of natural occurrence it should not be confused with any other species with the unusual rough, papery type of bark, persistent throughout. The flowers, which are produced mainly in March or a little later, are fairly large ((up to more than 20 per inflorescence), with brilliant orange or fiery-red, stamens. The fruits are elongated-urceolate with 2 valves. It is very spectacular in flower and useful too. Derivation of specific name: The species epithet 'phoenicea' has been referred both to a fancied resemblance of the attractive filamentous flowers to the fiery plumage of the 'Phoenix', a comparison that does not seem unjustified when one views the stunning profusion of blossoms on the tree, but also to the Latin 'phoeniceus' (bright red, scarlet), a questionable allusion to the flowers (the flower colour is orange). Stem: Trunk 6 to 12 m tall, up to 30 cm in diameter ( or tree to 25 m tall in Queensland) often divided into two or more stems, which, in turn, divide to form the framework of a moderately large but somewhat open crown, rarely multistemmed or mallee-like. 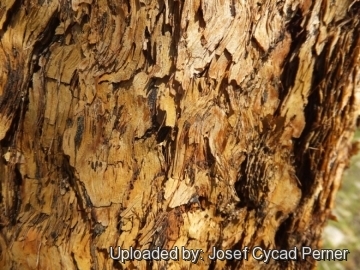 Bark yellowish, yellow-brown, orange-brown or yellow-grey, flaky, loosely fibrous, rough, persistent over the whole trunk and larger branches. Smaller branches with cream, white to pinkish-grey smooth bark. Branchlets not glaucous. Juvenile stems rounded in cross-section, hairy. Wood: Sapwood wide, heartwood dark reddish brown. Leaves: Alternate. Petioles 8–20 mm long. Leaf-blade lanceolate, 6.5–14 cm long, 1–4.5 cm wide, base tapering to petiole, concolorous to slightly discolorous, dull green to grey-green to yellowish-green. Juvenile leaves opposite or alternate, petiolate, ovate to almost orbicular, 4-12 cm long, 2-6 cm wide, base rounded to rarely shallowly lobed, apex rounded to acute, dull blue-green to green. Inflorescences (umbels): Axillary, single with 7 to more than 20 buds. Peduncles 16–33(-37) mm long. Pedicels 4–10(-15) mm long. Flowers: Bright orange to fiery-red. Mature buds clavate to pear-shaped 8–19 mm long, 5–8 mm across, bright green and not glaucous, calyx fused to the corolla and evident as 4 small teeth at the apex of the bud, hypanthium weakly ribbed, operculum hemispherical to conical, stamens inflexed, anthers oblong, style long, straight or sometimes hooked or bent beneath the apex of the bud, stigma tapered. Fruit: Cylindrical and urceolate, rounded at the base, weakly longitudinally ribbed, 19–30 mm long, 9–13 mm wide, pedicellate, pedicels 4–10 cm long, not glaucous, disc vertically descending, valves 2, enclosed. Phenology: Eucalyptus phoenicea, flowers after the wet season in (Jan.-)March-May(-July). Seeds from this species should be collected in September. 11) Blake, S.T. 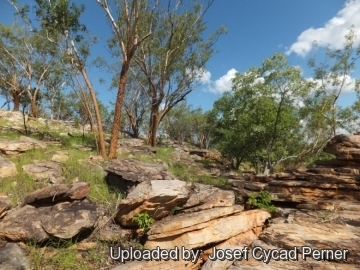 “Botanical contributions of the Northern Australia Regional Survey. I. Studies on northern Australian species of Eucalyptus.” Australian Journal of Botany 1(2): 205-207, 1953. 12) Hall, N. & Brooker, M.I.H. “Forest Tree Series” -1972. 14) Chippendale, G.M. in George, A.S. (ed.) “Eucalyptus.” Flora of Australia 19: 120, Fig. 51A-B, Map 80 1988. 15) Rye, B.L. in Wheeler, J.R., Rye, B.E., Koch, B.L., Wilson, A.J.G. (ed.) “Myrtaceae. 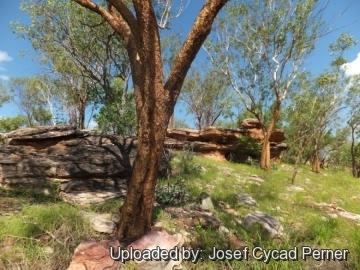 Flora of the Kimberley Region” 523, Fig. 158E 1992. 17) Dunlop, C.R., Leach, G.J. & Cowie, I.D. “Flora of the Darwin Region” 2: 166, Fig. 51, 1995. 18) Hill, K.D. & Johnson, L.A.S. “Systematic studies in the Eucalypts 8. 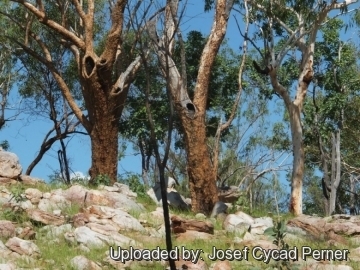 A review of the Eudesmioid eucalypts, Eucalyptus subgenus Eudesmia.” Telopea 7(4): 411 APC 1998. “A new classification of the genus Eucalyptus L'Her. (Myrtaceae).” Australian Systematic Botany 13(1): 93, 2000. Cultivation and Propagation: Eucalyptus phoenicea is is often regarded as one of the more attractive eucalypts of northern Australia, due to its conspicuous orange flowers. It is suited to moist situations on sandstone ridges or tablelands near the coast in tropical and subtropical climate, and can grow on poor and rocky soils. Water Requirements: It tolerates low levels of humidity and drought, though it prefers evenly moist but not consistently wet medium. When supplied with adequate moisture and fertilizer it is also fairly fast growing. This plant is drought tolerant once established. It dislikes soggy soils. Water young plants for healthy look and fastest growth. Traditional uses: In the Northern Territory the stems have been harvested for making didgeridoos (a wind instrument developed by Indigenous of northern Australia). Uses: It is used in gardening and landscaping in steep rocky terrains. Seedlings are quite slow, but speed up once they start to trunk. Time to ultimate height 20-50 years. Propagation: It is propagated by seed.